November 28, 2016, Auburn NY - Holiday Traditions is an event that was created by the Seward House over 30 years ago as a token of appreciation to the Auburn community. Since that time, other local cultural attractions and sites have opened their doors to the public for free the second Sunday in December. Now, the “open house” is a tradition, and again this year, participation has expanded to include churches and other non-profit organizations. Open from Noon to 5 PM - Come see the mansion decked out in its finest holiday decor! Featuring our current exhibits Contemporary Heirlooms: Quilts from the Piecemakers Quilt Guild, and The Auburn System: Photographs by Joe Librandi-Cowan. Open Noon to 5 PM - Visit the Schweinfurth to view two quilt exhibits, the Art Center&apos;s 35th annual Quilts=Art=Quilts exhibit and American Quilts: History and Art. This year&apos;s Quilts=Art=Quilts exhibit includes 65 quilts by 51 artists from the United States and around the world. American Quilts: History and Art features historical quilts curated by Jonathan Holstein from the collection of the International Quilt Studies Center & Museum in Nebraska. Children are invited to complete a scavenger hunt about the quilts and visitors will be able to enjoy shopping in the Art Center’s unique gift shop. Open Noon to 5 PM - Enjoy live entertainment by local musicians, see the Museum elegantly decorated by local florists and artisans, and get swept back in time as Seward House staff and volunteers tell tales of a Victorian Seward Christmas. A Special Christmas - presented at 4 PM by Auburn Chamber Orchestra. Steven Frackenpohl is the conductor and music director of the orchestra. Open Noon to 4 PM - All are invited back in time, and back to their childhood. The Museum/Ed Center will be decorated and the tree will be trimmed. There will be horse drawn wagon rides and musical entertainment. Santa will arrive at 12:30 PM on a horse drawn wagon and will talk to children about their Christmas lists. There will be special food and drink available. Come decorate some Christmas cookies, make some Christmas decorations and enter the Christmas contests. Admission and parking is free. Guided tours will be available and the gift shop will be open for unique Christmas gifts. Come join in the fun. Open Noon to 3 PM - Stop in for holiday music with the “Brass Infusion of CNY.” This 10-piece brass ensemble, directed by Tom Camp, will play a variety of Christmas hymns and songs in the church sanctuary, some accompanied by Lori Rhodes Pettit on Westminster&apos;s Skinner pipe organ. There will also be a display of "Shoebox Nativities" (homemade dioramas made by local individuals, families, and groups), and creches and manger scenes from a variety of families, cultures, and traditions which depict the story of Jesus&apos; birth. Church members will give tours of the historic church, including recently renovated areas, and will offer refreshments in the social room. 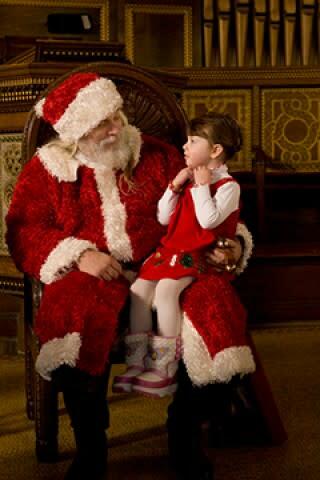 Open Noon to 5 PM - Read with Santa and partake in Christmas Carols at the Chapel. Bring your children and grandchildren for some holiday magic. Read with Santa from 1 to 2 PM. Then enjoy Jennifer Solva’s Music Studio’s performance from 2 to 3 PM. Lastly, Sandy McNabb will play Christmas carols on the Steere and Turner organ from 3 to 4 PM. For more information, about Holiday Traditions, or for a photo from the past events, call the Cayuga County Office of Tourism at 315-255-1658. If you have questions regarding a specific venue, please phone them directly. To ensure communication between the many Holiday Traditions’ partners, the City of Auburn’s Historic & Cultural Sites Commission coordinates publicity and advertising for this event. The Commission site members include Auburn Public Theater, Auburn Schine’s Theater, Cayuga Museum & Case Research Lab, Harriet Tubman Home, Schweinfurth Memorial Art Center, Seward House Museum and Willard Memorial Chapel.